With your horse securely tied, take a brush and groom the horse’s back where the saddle will rest. Anything that’s not supposed to be there could causing chafing and hurt the horse so do brush thoroughly and check to see if there are any sores as well. Place the saddle pad or blanket just forward of the horse’s withers so when you put the saddle on, it doesn’t force the horse’s hair to be pushed up. The pad or blanket should also be even on both sides. Place the saddle on your horse’s back without moving the blanket. Also, don’t plop it down too hard or your horse may get spooked. After you’ve done that, go to both sides of the horse and make sure that there aren’t any wrinkles in the blanket and the horse’s hair is flat. Moving to the left side of the horse, reach under it and pick up the free end of the cinch or girth. Once you’ve done that, fasten them slowly to the correct location. 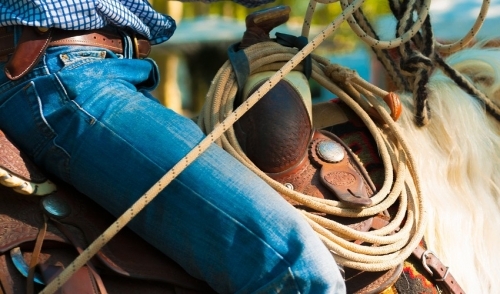 Just like you did with the saddle, make sure your horse’s skin isn’t wrinkled under the girth. If it is, stretch out your horse’s front legs until the girth readjusts to remove them.